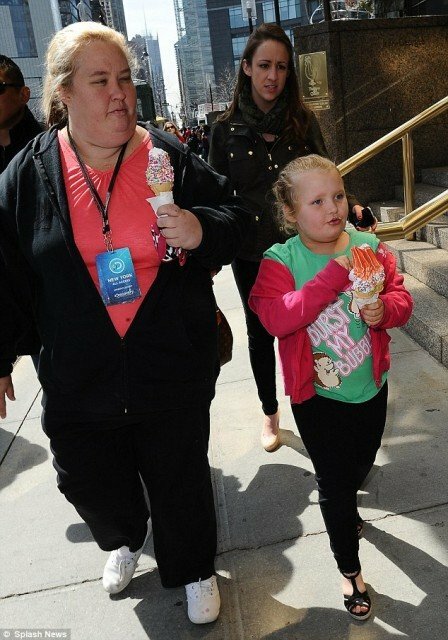 Honey Boo Boo’s visit to New York got even better with a trip to the ice cream truck with mother June Shannon on Thursday. The 7-year-old reality star pondered the mouth-watering selections pasted on the side of the truck for some time. Finally Honey Boo Boo chose a double strawberry soft serve twirl on a wafer cone with sprinkles. It definitely seemed way too much for one little girl to eat by herself. In fact, she appeared to have difficulty even holding the cone in her little hand. But Honey Boo Boo made her cool treat shrink by the second. Her mother June Shannon, 33, who recently dropped a whopping 115 lbs, followed close behind and even enjoyed a treat of her own – just one day after showing off her slimmer new figure in a mostly black ensemble with gem-collared top. June Shannon’s ice cream was a single soft serve cone with sprinkles and definitely not good for the diet especially if she means to keep the weight off. However, judging by how she lost the weight it might just come back anyway. Halle Berry pregnant and expecting a baby boy?